It’s a new review, and today we’re continuing our study of the controversial Fang Gang by taking a look at Gobba. All three Mixels in this tribe have names referring to their mouths, haven’t you noticed? Indeed, one incredibly obvious aspect of Gobba is the size of its mouth. I mean, look at that thing! I bet it could go toe to toe with the Pepperami man, though Chomly would make a better matchup. Gobba only comes with three parts in Dark Orange, all of which will be used up fairly quickly, but take a look at that wedge part (48933), which appears to be exclusive to this set. To make up for the lack of Dark Orange, we have eight Dark Brown “baby bows” and three new teeth plates in White, which is the most we’ve seen so far with a Mixel. This one also has the alluring 1×1 round tiles with eye print. Gobba has a similar round body to Krader, and the two socket joint plates are used for its arms, which are similar to the two-fingered offering with Volectro. A 1×4 curved slope plate serves as the bottom lip, complete with one of the teeth plates. Witness the sheet size of Gobba’s mouth as its head is constructed, using the large Dark Orange wedge part. The Red parts are cleverly used to form the underside of the mouth and a tongue. There’s a good amount of articulation in the arms and the opening and closing action of Gobba’s mouth, but this time the legs have no articulation at all. 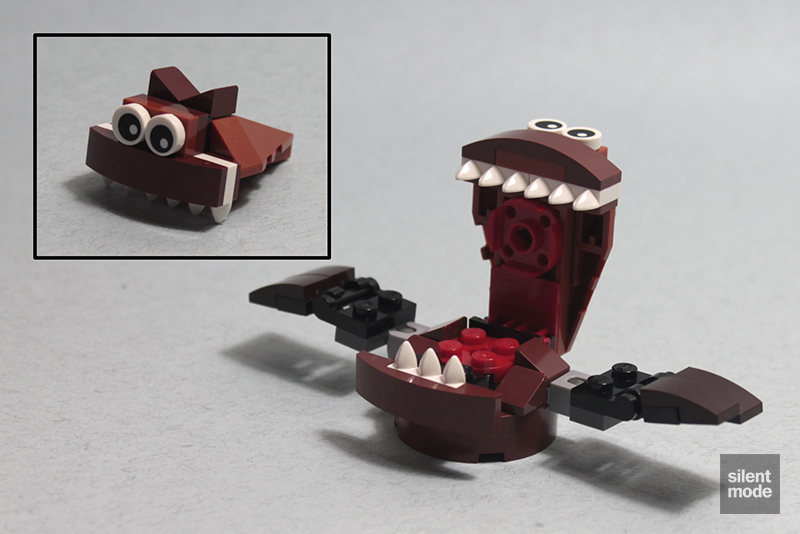 The Technic pin used in the middle indicates that Gobba can spin around on the spot instead… much like Krader! Because a friction pin is used, it’s not so much spinning as it is rotating. 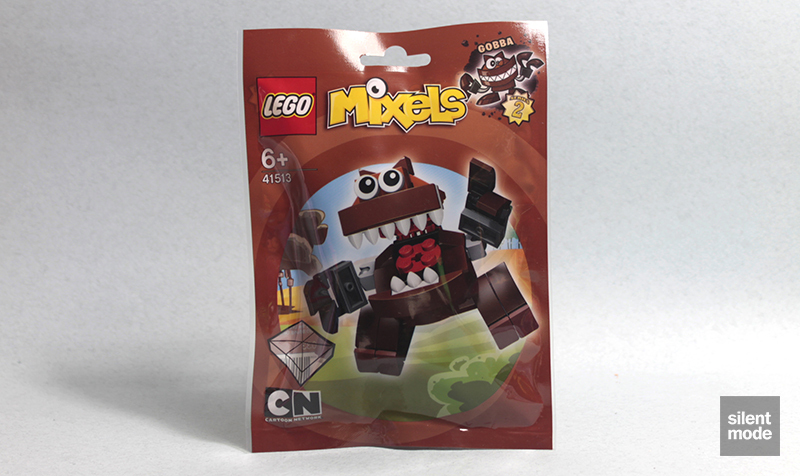 Witness the power of Gobba: a terrifying Mixel who can devour a landfill site in minutes and out-gossip a workplace. Its articulate fingers allow it to clean up every single spot. GOBBA lives with the rest of the hungry Fang Gang tribe on a weird farm where they try to plant anything to see if it grows into food. The Fang Gang can go seriously crazy if their stomachs are empty, so use GOBBA’s amazingly sensitive tongue to seek out the best food on their homeland and avoid the things that are less tasty. Some say GOBBA can even taste feelings – sadness is very salty! We get four leftover parts this time, which you could store in your collection or feed Gobba with. This is one of the more interesting Mixels so far, and is probably my favourite of the three in this tribe. Even though its legs don’t move, the rotating (rather than spinning) action makes up for it, and the arms and mouth provide enough articulation to play with. The only improvement I can think of is to employ a few more of those joint parts – or even Technic parts – to be able to rotate the feet. Other than that, I can’t find much fault with this one, so I’m going to give it 7.2/10.